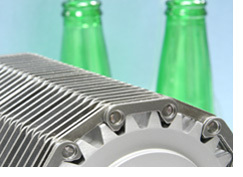 Allguard FX is Ramsey’s original wear protected conveying chain. With unique, wear resistant links covering and protecting the chain, Allguard FX can run in direct contact with lateral guides, immune to the pin head wear which can destroy typical chains. Allguard FX is available in 1/2″ pitch multiguide, side guide,and center guide designs, as well as 1″ pitch extended pitch multiguide designs. Lifeguard® chains have patented interlocking side links which guard against pin head wear and greatly reduce the size of gaps between adjacent side plates. With much smaller gaps between the links, smooth product transfer on and off the conveying surface is assured, especially with small items. Lifeguard® is available in 1/2″ pitch,as well as 1″ pitch extended pitch. 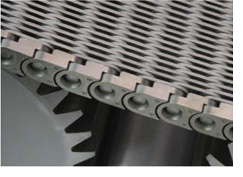 Our newest line of wear protected chains, Sentry combines the best features of single pin and two-pin conveying chains. Features include: guard links with fully recessed pin heads, 100% hardened alloy steel construction- no sintered metal, two pin chain joints, extended pitch chain design, staked pin heads, and pre-stressing for reduced chain elongation. Ramsey’s patented R-Select chains put highly wear resistant alloy links in the parts of the chain which are expected to wear the most. Other parts of the chain, which are less subject to wear, are made with economical standard, steel links. Because the chain is not made entirely of more costly wear resistant links, the overall cost of the chain can be as little as 20% more than the cost of a standard chain. Ramsey All-Steel chains are wear protected chains made from 100% steel. 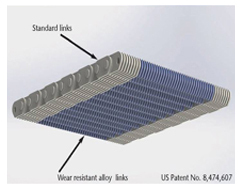 Unlike other chains which use head protector links made from pressed metal and are susceptible to cracking, All-Steel chains use guard links made from 100% hardened, alloy steel. All-Steel links will never crack under pressure! Developed specifically for hot end glass bottle transport, All-Steel chains are also ideally suited for many types of industrial conveying. 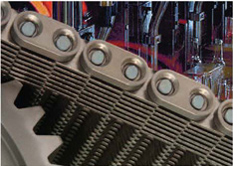 The RKO tool, or “Ramsey Knockout Tool”, is designed to simplify the connection and disconnection of all Ramsey single pin conveying chains, including Allguard FX, Lifeguard, and All-Steel chains. The patented tool allows pins to be easily removed during chain disconnection and new connecting pins to be secured during chain connection.